Motocross Near the St. Louis Arch? Yes, it’s true! We invite you to join us for motocross riding at its finest. Conveniently located less than six miles from downtown St. Louis, the track is nearly 1.5 miles in length and the soil is a mixture of river bottom loam and sand. There are a variety of jumps, from easy to difficult, but all are forgiving. Our goal was to design a track that would challenge all skill levels without sacrificing rider safety. There are no “do or die” gap jumps! On scheduled Open Practice days, the track is fully race prepped, safety flaggers are positioned throughout the course, and riders are divided into groups based on bike size and skill level. Come out and experience the track everyone is talking about! The track is open only on scheduled Practice and Race Events. On open practice days, the cost is $30.00 per Rider/Wristband. Practice days held in conjunction with a Race Event may require a gate fee. Be sure to check the event page for complete details. Important Note: Each rider must complete a liability waiver in order to participate in our events. Minors are required to have a parent/guardian present to sign the release. 5100 St. Clair Avenue, Washington Park, IL 62203. Take Interstate 64 to Highway 111 South (Exit 6); go right on St. Clair Avenue Track is on the right behind the three large white warehouses. 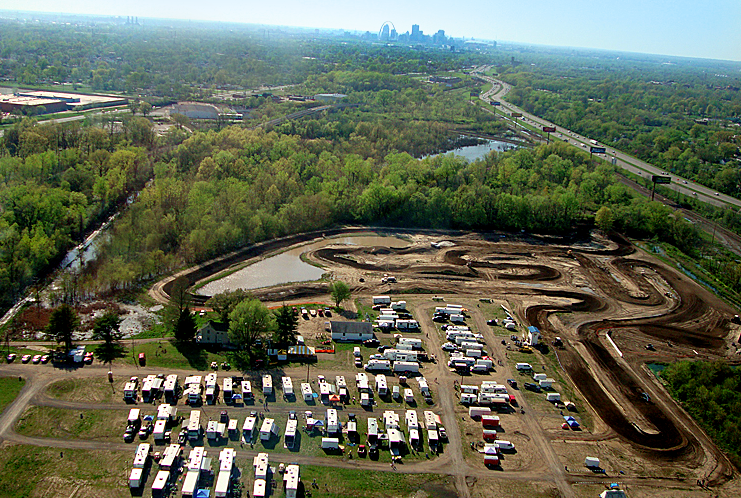 Premier Motocross Track in the Metro East, conveniently located less than six miles from downtown St. Louis. My sons favorite track and by far the best dirt around locally. Always have a great time there. One of my favorite tracks in the Midwest! Tracks is always in good shape and is super fun, nothing to crazy big for jumps but the flow of the layout is perfect! This track is so fun. A lot of technical stuff plus some high speed elections, and nice ruts. The dirt is perfect for moto and the staff is excellent!